If you see the small dot on every picture....its not eye problem...its my camera finally came to final days...yeahh!!! time to change you baby! I snap this photo while taking bus from ferry terminal to hotel. Yeah!!! hand busy taking photo right after I touch down Macau land! Seriously the weather is freaking hot...most of the time. You want me to purposely stop and walk around this place???? hahaha....hell...I don't want to come back Malaysia look like yummy dark chocolate brownie. Ok...this is to my eyes...so all those religious people don't bash me, ok!!!! No hard feeling on this, ok! According to legend, A-Ma is a poor girl. She is looking for passage to Canton. Many refused to take her because she look to damn miserably poor. However, one lowly fisherman took pity on her and get her on board. Good uncle! Bless you uncle fisherman! A Ma joy not for long....storm came....blew up and wrecked the whole boat! The poor A Ma was on board and unable to safe herself. What happened to A Ma???? 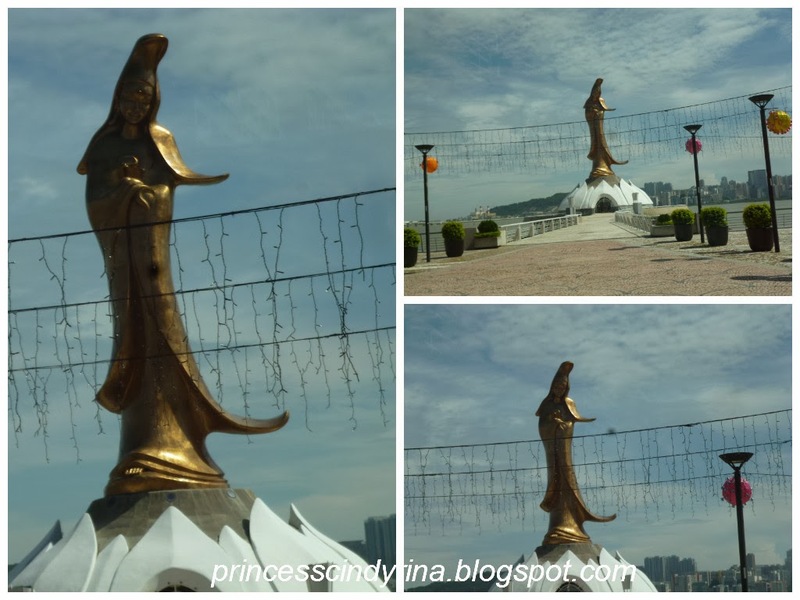 A Ma re appear as a Goddess and the fishermen built her temple and statue ! I know I know...the story a bit out...ok ok not a bit...but totally out! How that A Ma came to Macau and not Canton...or what ever....mmmmmm.... seriously....can't you just google it ???? I am not that nerding genius who really can remember what I read in that Museum! Oh! I guess... many people will start calling me small brain woman after reading this post...huh??? My Macau post still not finish yet...to be continued next week!!!! Get updated by subscribing FOC use your email !!! No harm to entertain yourself with my craps stories... right?? ?